One of the things that makes Fuddruckers burgers so good is the meat- they grind their meat in-house. Of course not everyone can do this at home, but to replicate the taste of the original, try to get some good ground ribeye. Proceed to shape the meat into a patty using a form if you have one, otherwise shape it as evenly and as round as you can. Give the ingredients a good mix in a small bowl. On to the grill! Fuddruckers uses a flat top griddle, so that would be the ideal to closely replicate the cooking process. Season the patty, placing it on the heat with the seasoned side down so you can season the other side as well. At the same time you can crisp up some bacon alongside the patty. Flip the burger once the first side is ready, and lay down some Cheddar cheese on top. Once it has molten, move the patty over to radiant/indirect heat. Use the same side of the griddle (indirect heat) to fry an egg and give the buns a quick toast. 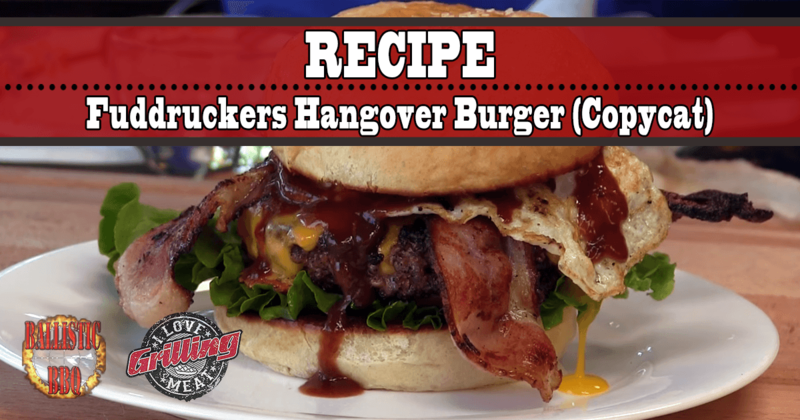 Time to assemble the Hangover Burger! Since when you buy the burger at a store you are able to add any ingredients you like, this is only a suggested list of ingredients- feel free to add/remove whatever you want.